As promised in our previous post about the Zerynth and Xinabox partnership here is a tutorial on how to get started with the new XinaBox development board with the onboard Zerynth license. The XinaBox CW02 board allows developers to make their devices both smart and connected, with just a few lines of code in Python. And all of that with just one purchase, since the Zerynth software license is already onboard. IoT sensor applications and all kinds of wireless sensing projects can be easily accomplished with this development board. It’s a versatile out-of-the-box device programmable in Zerynth. So, since you are already familiar with Zerynth, this board is just another building block in your development process. The CW02 is one of the development board created by XinaBox that mounts on-board the official WROOM32 module. The XinaBox CW02 contains a dual-core ESP32 microcontroller by Espressif Systems, that has both WiFi and Bluetooth Classic/LE support, 4 MB of SPI Flash, tuned antenna. Power to the XinaBox CW02 is supplied via the XinaBox IP01 module (USB Programming Interface). This module has an onboard USB A connector and can be connected to the CW02 core module through the ☒BUS connector. To assemble XinaBox CW02 and IP01 modules it’s best if you follow the instructions from the XinaBox website. As a summary before you begin, there are only two rules: all the xChips have to face the same way up, and all the notches need to match. Register the device by clicking the “Z” button from the Zerynth Studio. In this phase, you should redeem your coupon (see the following section). You can find more info about this workflow here. At the moment of the registration of the board, you will be asked to enter a Voucher Code. Enter the Voucher Code in the required field. And that’s it, your Zerynth License is activated. After the virtualization, the XinaBox CW02 is ready to be programmed and the Zerynth scripts uploaded. Just clone the example “Hello Zerynth” and uplink the script into the board. And here’s the code, take a look! print("Hello Zerynth!") # print automatically knows where to print! 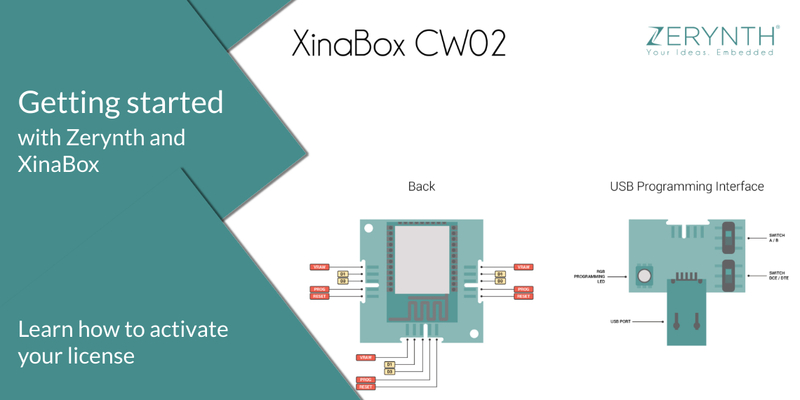 We hope that this tutorial was valuable to you and that you are already thinking about a way to use the XinaBox CW02 board in your next project.